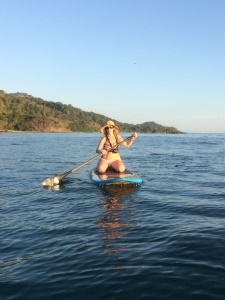 Surf and Sup at Santa Teresa. 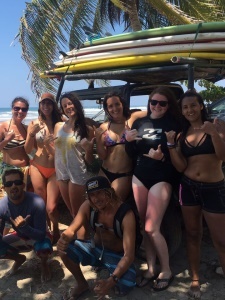 … and I will be glad to be your Surf instructor and SUP tour guide in Santa Teresa, Costa Rica. 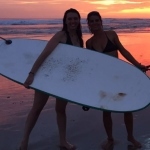 I am the manager and instructor of Costa Rica Surf and Sup, I’m been living in the Nicoya area for years and I found amazing places for surfing and going SUP. I am a certified life saver and I speak French(my native language), Spanish and English. 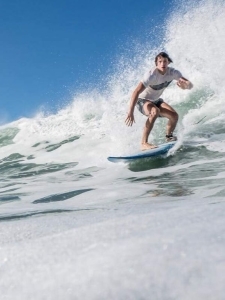 I believe that anyone can learn to Surf, I don’t take this phrase lightly, I put my heart and all my strength in every lesson. 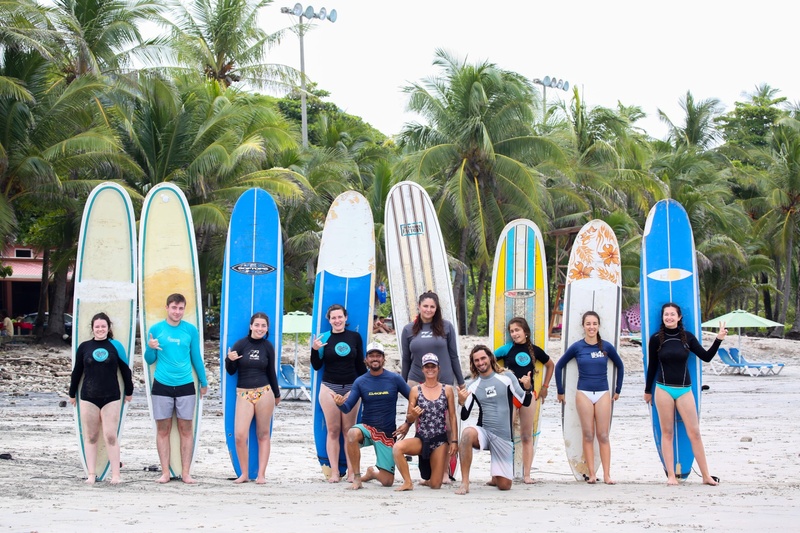 I invite you to explore the rest of the site to find more info about the surf lessons and the SUP tours. 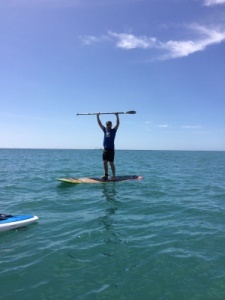 Also in our image gallery you can watch photos of me with my students surfing and doing SUP. Feel free to contact me if you have any question, I will reply you as soon as I can. 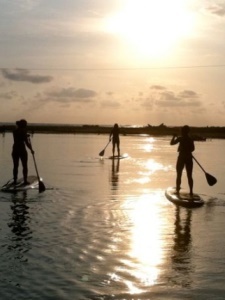 Do you want the whole Santa Teresa surf and SUP experiencie? Check out our different options for your tours. If you have any doubt or comment don’t hesitate to ask us through the contact form first. 2 hours of lessons just for you with tons of tips. Pick you up at the hotel. You should bring water, sunblock and water proof camera(Optional). Surfboard and rash guards included. 2 hours of lessons for two people. Pick you up at the hotel. You should bring water, sunblock and water proof camera(Optional). Surfboard and rash guards included. 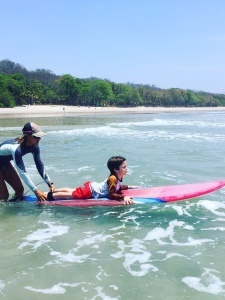 Kids lessons: from 60$ each kid! 70$ for one child, 60$ each kid if two or more kids. 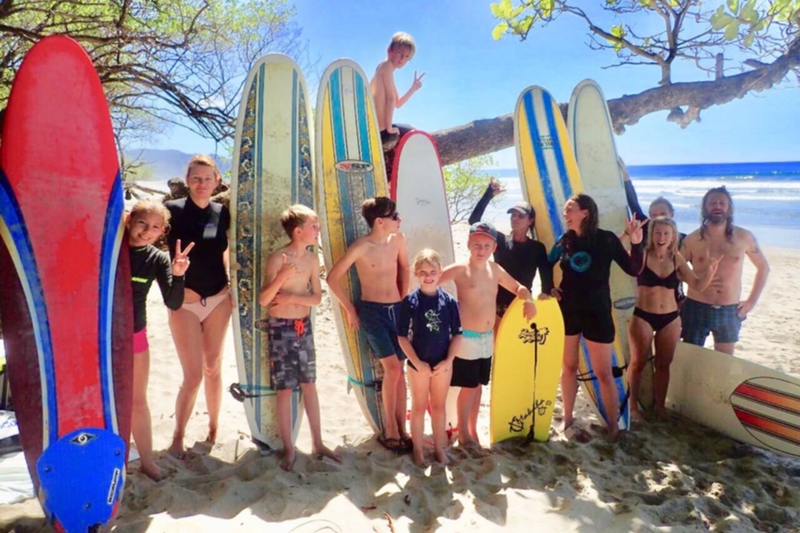 2 hours of surf lessons for kids. Pick you up at the hotel. You should bring water, sunblock and water proof camera(Optional). Surfboard and rash guards included. 2 kids maximum per instructor. 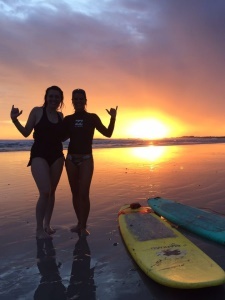 2 hours of surf lessons for you and your friends or family. Pick you up at the hotel. You should bring water, sunblock and water proof camera(Optional). Surfboard and rash guards included. 4 people maximum per instructor. 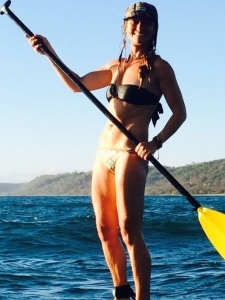 Do you want the whole Santa Teresa surf and SUP experiencie? Check out our different options for your tours. 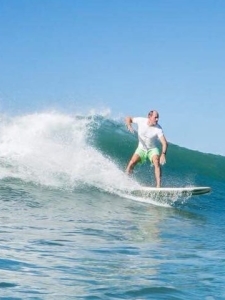 If you have any doubt, comment or want to book a lesson don’t hesitate to ask me through this contact form. 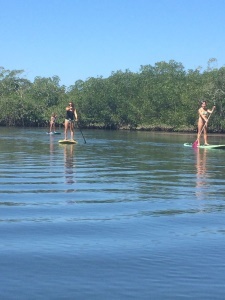 Surf the waves at low tide and SUP at high tide. The best of both worlds. 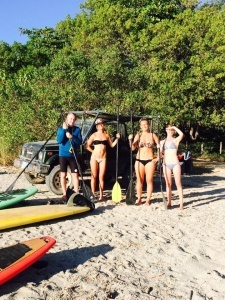 2 hours of surf lessons, 2 hours of SUP lessons. You should bring water, sunblock and water proof camera(Optional). The time of both activities depend of the tide. Surfboard and rash guards included. 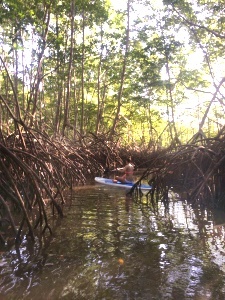 Make the most of your time with three surf lessons, use of a rashguard, and one(1) SUP ocean cruise. 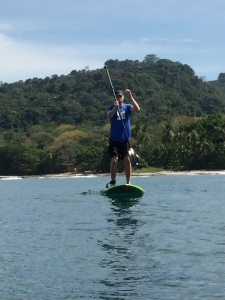 2 hours of surf lessons every day, and one ocean sup tour. 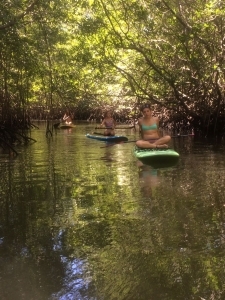 This half day(5 hours) trip is for the exploration minded, and best for groups of 3-4 people. Perfect for families. Transportation and lunch included. Pick you up at the hotel and light lunch included. 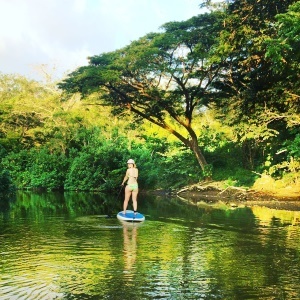 Sup Boards and rash guards included. 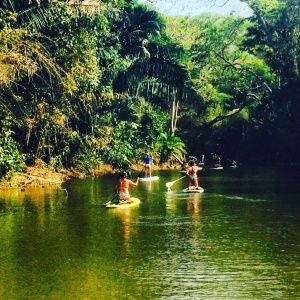 Get comfortable with your board in the calm and glassy Manzanillo River, then head to the Manzanillo Bay and finish off the tour in the ocean. 70$ each for two people group or more. 80$ if there is only one person. 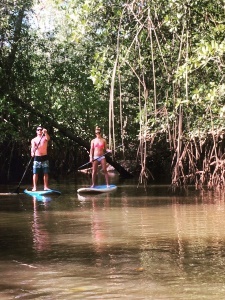 Paddleboard in Mal Pais, near Cabo Blanco National Park. 80$ each for two people group or more. 75$ if there is only one person. Do you have any questions? 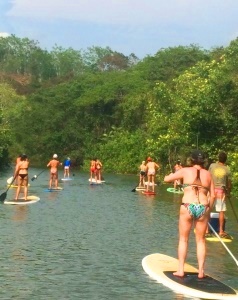 Do you want to reserve your surf lessons or SUP tours with us? Or you just want to say hi? Just fill this form here and we are going to reply you as soon as we can. You can call or send us a Whatsapp message too: (506)8434 0444. 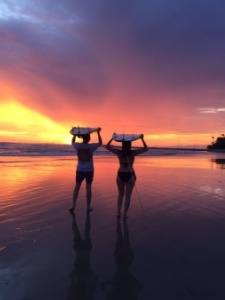 Vehicles that had been specially modified, designed, and adapted to give you as a traveler, a full and complete independence in your discovery of Costa Rica. 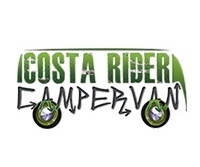 Dont forget to visit Santa Teresa in your Campervan.